A massive lizard carries a city on its back. A paunchy adventurer fashions two chainsaws and a kendo stick into a two-pronged zombie-slaughtering weapon. A monster pig with ninja skills seeks revenge for the consumption of his family. These are just some of the outsize images typical of the art of comic book creator Geof Darrow, who's best known for his intricately designed scenes of mad machinery and inventive mayhem. His 13-year stint as a Chicago resident will be ending soon as he departs for France (exact location to be determined), but he'll be leaving behind his art, including a long-awaited reprint of the hard-to-find first arc of his signature work: The Shaolin Cowboy: Start Trek. Originally from Cedar Rapids, Iowa, Darrow, now 62, first came to Chicago when he enrolled at the now-defunct Chicago Academy of Fine Arts in 1972. Since graduating, he's bounced around between Chicago, Los Angeles, France, and, occasionally, Japan. His career has been similarly diverse, shifting from the grunt work of Hanna-Barbera animation to doing conceptual design for the Matrix films and other Hollywood fare. But his friendship and collaboration with French artist and comics legend Moebius beginning in the early 1980s inspired him to pursue his true medium: the comic book. 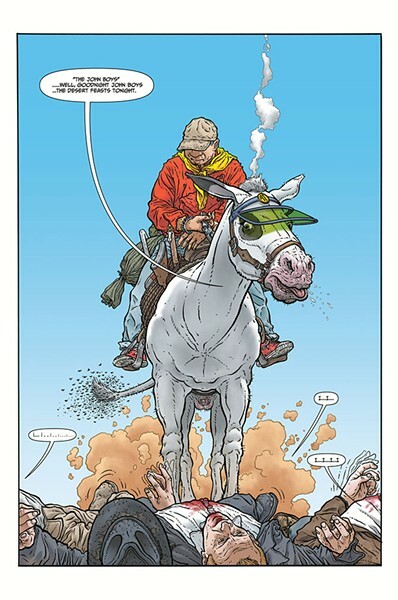 While hard-core fans may have picked up his collaborations with Moebius and stories about Bourbon Thret—a precursor to the Shaolin Cowboy—Darrow first gained attention in America in 1990 with Hard Boiled, an Eisner-winning collaboration with writer Frank Miller, with whom he would later cocreate Big Guy and Rusty the Boy Robot. Then there's The Shaolin Cowboy, originally published by now-defunct Burlyman Press in 2005. The titular character is a schlubby blend of Shaolin monk and Robert Mitchum acolyte who can't seem to avoid trouble, whether in the form of dopey rednecks or evil King Crab, and the series is equally action comic and idiosyncratic experiment. For example, in the second arc, Shemp Buffet, the Shaolin Cowboy fights zombies. What could be more mainstream than that? But he fights those zombies in a wordless, sprawling, 100-plus-page gore fest in which every body part, blood spurt, chainsaw slice, ill-advised tattoo, and zombie cat is rendered with the exacting line work that is Darrow's trademark. Such scenes exude a gleeful intricacy and lust for detail that set Darrow apart from other comics artists. "Everything matters," he says. "It matters to me. I draw all that stuff because it adds content, and it makes it very particular. Each one of those drawings, each one of those streets: they're not generic. . . . I try to make everything its own creation so it doesn't get boring. It adds character to the drawing." While you can't talk about Darrow without obsessing over his obsession with details, there's much more to his craft. As Mike Mignola, creator of Hellboy, writes in an e-mail, "Sure, he puts every little nut and bolt and spinning wheel into every piece of machinery, but just look at how well drawn his people are. And his animals. And everything else. Cramming a drawing full of stuff is one thing, but his locations feel real, his living things have real personality. No matter how crazy his action is, things bend and move naturalistically. He is all-around an amazing artist." Darrow's experiences and interests don't entirely account for his maximalist style, but they explain it a little. His inspirations include samurai classics such as Yojimbo (1961), directed by Akira Kurosawa and starring Toshiro Mifune. "I think Yojimbo just took the top of my head off when I saw it. I still think that's the archetype for most loner heroes," said Darrow. "I can watch that thing over and over: it is so amazing. Because it's a comedy as well. And yet, it's horrible. I can't think of any movie that sets up what's coming more than the beginning of that movie, when Mifune walks into town and the dog runs out of the alley carrying a human hand in its mouth." Darrow fans will recognize that exact image popping up in his art from time to time as a hat tip to the inspiring film. On a more mechanical level, Darrow's time as an animator for Hanna-Barbera was instructive, if not fun. "In animation, you have to draw things in perspective," said Darrow. "Because you have to turn whatever it is around, whether it's a car or a person. At the time, mostly what I did was cars and trucks and boats and telephones, whatever objects they needed. It was a real eye-opening experience." Another benefit of that experience was getting to know one of his artistic heroes, Jack Kirby, creator or cocreator of many superheroes including Captain America, the X-Men, and the New Gods. Darrow's dense scenes also have great depth, which is informed by his "artfather" Moebius and filmmakers such as Anthony Mann, director of many Jimmy Stewart westerns, a genre close to Darrow's heart. "[Mann's] film compositions had a foreground, a middle ground, and a background, and an incredible amount of depth," Darrow says. "I always tried to get that kind of depth into what I do, because I think that's really interesting." But Darrow's depth is far weirder than Mann's. A memorable two-page spread from The Shaolin Cowboy: Who'll Stop the Reign? features a ninja pig flying through the air, squealing and sweating and bent on vengeance, while all manner of people and dogs and other animals go about their business; the background is filled with graffiti, discarded cans, cigarette butts, and dog crap. Darrow's frequent inclusion of dogs is influenced by his time in France, where he says "dogs are king," but contrast is king in Darrow World. "I love the idea of drawing crazy things in the foreground and then in the background being semi-realistic," said Darrow. "Or at least I attempt to draw realistically. And it makes the crazy stuff seem even crazier because you can identify with the background." Geof Darrow, the artist best known for creating the look of the Wachowski brothers' breakthrough movie, is back in Chicago working on a new comic book series.